Yesterday I wrote about D&D Next Monster Design. I wanted to add a bit more after looking at it through the lens of Organized Play. Organized Play is a large category of play that encompasses any type of gaming that is meant to bring together the larger public. I maintain a list of D&D organized play programs here on EN World. I also mention other non-D&D programs. I began to be involved with organized play (also known as the RPGA) in 2000 with the Living Greyhawk 3E campaign. My involvement in organized play was a sea change for me. It exposed me to thousands of gamers. At a single game I might meet 3-4 new players and a new DM. At a convention I might play up to 18 adventures (why sleep?) and meet 18 DMs and many new players in a single convention! When DMing at a large convention like Gen Con (which offers fabulous prizes for DMs, including free room, free badge, and tons of loot!) I might run the same adventure for 5 or more different tables, many containing players I’ve never met before. An adventure I write or administer might run over a thousand times, providing scores of sets of feedback. Organized play offers many insights into how an RPG is played around the country. If you travel for work, as I often have, you then get even wider insights as you actually travel to different groups (rather than seeing just the gamers that travel). Organized play provides a great way to analyze the impacts of monster design. What we generally see with monster design is that there is a limit to what a DM can absorb. This is especially true when we consider the two different scenarios: 1) the DM has carefully prepared the adventure. 2) the DM was handed the adventure minutes before sitting down at the table. In scenario 1, the monster design should ideally offer a prepared DM cool options to make the adventure fun. This is especially true when the DM is running the table multiple times. For example, there is a neat solo that the authors and I worked on for Ashes of Athas 4-1. It has some great powers, and every time I run it the monster feels fun, different, and engaging. And yet, it isn’t overly complex. Conversely, an AD&D adventure with an empty room with 20 goblins can become increasingly boring every time you run it. In scenario 2, the DM could be nervous and when he or she looks at the printed page we want the monsters to make immediate sense. Powers should be clear, straight-forward, but also fun and dynamic. Ideally the powers have logical components so that the monster plays as if the DM had prepared the adventure carefully. “The hook horror impales you on its hook, then flings you toward your companion!” That sort of thing. How the monsters are formatted for an edition will drive how that takes place. Let’s take a brief look at organized play stat blocks. That one came from the first Living Forgotten Realms adventure I had the pleasure of writing, What Storms May Come. The monsters are the finale to the Radiance Against Thay story arc. What you see is the low-level version. A second page is incredibly similar but the lich and wraith gain a level (which impacts only HPs, attacks, defenses) and we add a demonic flameskull. The 4E version is pretty concise. The format really helps to categorize the content. With a very minor amount of experience the DM knows where to find the names of the creatures, the defenses, the major attacks, the triggers, etc. It mostly fits on one page. Across LFR adventures (or Ashes of Athas) it is practically nonexistent to find a single encounter have more than two pages of monsters for one tier of play. This encounter has some older monsters (for example, the auras would be a trait in more modern 4E design), but overall this is pretty clear. One thing I like (and why I chose these monsters when I wrote this encounter) is that the monsters can be pretty good on their own when run simply, but can also be really fun and wicked when run by an experienced DM. You can choose to have auras be in tactically fun places. You can use the reach effectively with the terrain. But, you don’t have to do any of that for the encounter to be fun and challenging. Despite being fairly complex by 4E standards, a DM can run this adventure cold (without preparation). The 3E monster might look pretty similar at first. This fits in one page. Now, that isn’t always the case. 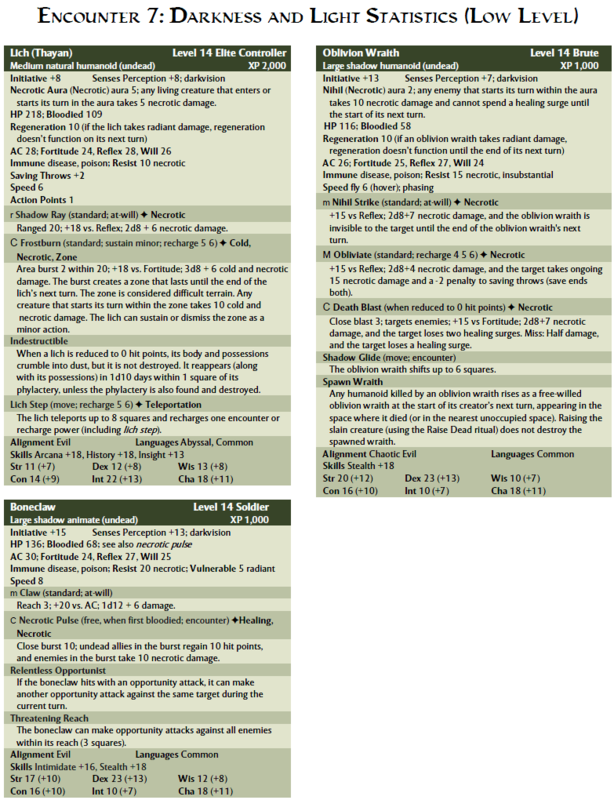 Living Greyhawk stat blocks for a single tier of play can cover 3 or more pages when you have class features or monster powers that need to be printed (for example, a multiclass bard/cleric on top of an already complex monster with its own monster abilities and spells can fill a page and-a-half). 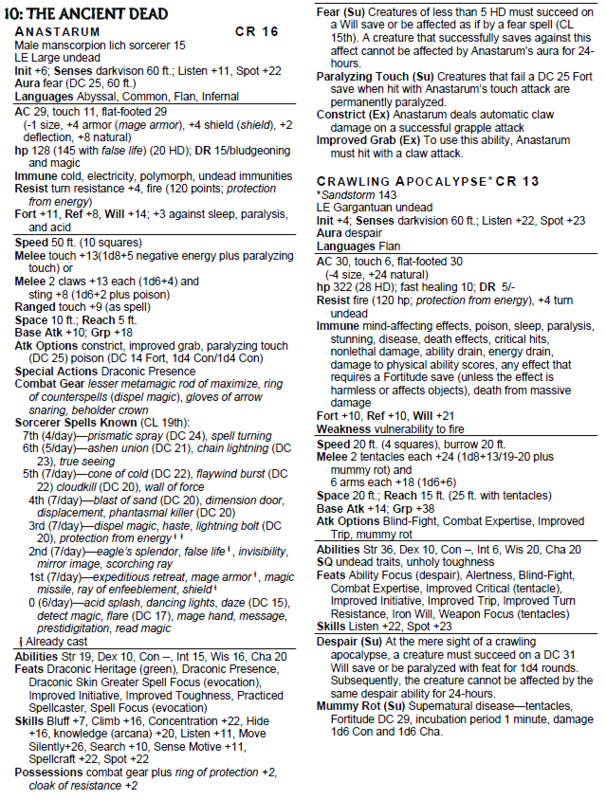 Even for this version, the monster (a manscorpion with 15 levels of sorcerer) is very complex. He has 36 spells, none of them detailed here. Several of the spells are detailed in the appendix as “new rules”, but others would require either prior knowledge or owning the books. He has 7 feats. The feats here are largely simple ones already included, but that wasn’t always the case. Draconic Presence is mentioned in the appendix and causes a fear effect every time this monster casts (and saving throw, etc.). He has 4 supernatural/special monster abilities, such as the paralyzing touch. Again, these aren’t too bad, but they can be. The person who wrote this encounter is very experienced and knows to keep big fights as simple as possible. Sometimes these were really complex. He has gear. Some, like the rings and cloak, are figured in. The metamagic rod, ring of counterspells, gloves of arrow snaring, and beholder crown all require knowledge and are not detailed here. They are pretty as critical as anything else in the stat block, and basically require you as DM to prep these and write down what they do beforehand. (Or, you know, frantically look them up in the middle of combat). He has DR/bludgeoning. The type of weapon matters, so as DM you have to monitor this. The Crawling Apocalypse isn’t a spellcaster, thankfully, but it has 10 feats and many of them matter. The DM should understand the trip rules and Combat Expertise. The Apocalypse also adds important fear and mummy rot powers and has a set HP value of fire resistance (which needs to be tracked… because after that it has a vulnerability to fire!). It has a huge laundry list of immunities, including things like nonlethal damage, critical hits, and any spells with a Fort save. There is no question in my mind which one is easier to run. When we look at organized play, DM preferences back this up. DMs would offer say “low APLs only”, meaning they didn’t want to run high level play. This was because they felt they lacked the knowledge of how to deal with these complex monsters (and their spell lists). (Some of this was also because players brought a wide range of feats and especially spells to the table, especially ones with complex interactions that required adjudication). With 4E organized play we see DMs far more willing to judge whatever is needed. We also see DMs willing to run an adventure cold – the issue becomes doing a good job with a complex plot and story, not whether a DM can handle the stat blocks (because that part is now easy). Importantly, these factors don’t just happen once in an adventure. Many organized play adventures have to handle different PC levels. Living Greyhawk and LFR use a tier system, where an adventure can offer a challenge for PCs of a different “average party level”. You take the total levels of all PCs, make sure none are too far away from the mean, and derive an average. The DM then runs that version of the fights. In an APL system you heighten any complexity issues. This was a legendary problem with LG. In COR8-11, it only covers three APLs (10, 12, 14). Still, that means 3 pages of that manscorpion sorcerer. And, it changes at each level. At APL 10 it is a level 11 sorcerer. It loses a number of spells from the level 14 version, loses a feat, and loses some gear. And again, this was handled well. In some adventures you had a completely different spellcasting class! Maybe it is a cleric at APL 10, because that’s a great challenge!!! At its worst, you had an adventure where an encounter covered three pages for a single APL, you had 6 APLs covered, and the monsters were incredibly different for some of those APLs. Nightmare. LFR has some APL issues, for sure. They had a simpler high/low tier system but went to an APL system and do find issues with battle interactives where they need to support a wide range in APLs. Do you have the same monsters in each or new monsters? Does an APL 2 lich make sense? However, by and large this is still far easier to run than the LG 3E equivalent. For a small set of tiers (2-3), 4E is far and away superior. Monster powers generally remain exactly the same. None suddenly show up or go away – we just change the attack bonus and damage, and perhaps the ongoing damage and amount of forced movement. For the DM it is nearly transparent. Monster design in 3E was a barrier to entry. It was common in LG to see an author say “I don’t write stat blocks”. Conversely, some people loved that. Adding levels of a certain class to a certain monster was an area requiring deep expertise and resembling art as more than science – some people had a genius for it, and the rules alone could not help you. I was one of those authors that didn’t want to touch monster construction. This forced organized play campaigns to work with teams of people. A story writer had to be paired with a stat monkey. Battle interactives had to cede creative control to the stat monkeys, because eventually no challenge would be sufficient without these geniuses. It was a problem. In contrast, 4E is simple. Stock monsters are a sufficient challenge. An organized play campaign could just use the two Monster Vaults and Dark Sun Creature Catalog and be fine. For fun, an author can create their own (we do that often in Ashes of Athas), but it isn’t necessary. The reason we do it in AOA is largely for story – we want to bring back older monsters that don’t have a 4E version. Monster design has never been a problem with any 4E project of which I’ve been a part. In addition to the goal of simplicity we identified last time, it is advantageous for a monster to take up a small part of a printed page, so all the monsters in an encounter can fit on one page. Monster design should use clear/standard headings so DMs can absorb and run a monster even without preparation. 4E did this well. Keep additional complexity to a minimum, especially when it requires flipping pages or opening books: Adding gear, feats, and special abilities vastly increases complexity. Are these really important? Are they best as monster powers or converted to an easy-to-run monster-specific format? As mentioned last time, turn spells into powers. Spells vastly increase complexity and create massive barriers to entry. Monster construction should be simple. We want a DM to feel they can make a monster even if they started DMing last week. With a low barrier to entry, this becomes something that encourages players to become DMs and organized play contributors. Monster adjustment should be simple to increase the challenge. An author should find it easy to select a monster and then tweak the encounter for a higher or lower level party. Class levels should be avoided, at least in the traditional sense. Building a character takes time and makes leveling very difficult. Adding class levels to monsters approaches an art form and becomes a barrier to entry for DMs and authors. If class levels must be used, find a way to summarize them rather than actually require such detailed construction work. I’m glad that the open playtest comes with a complete adventure, including spellcasting monsters. I’m hopeful that as the playtest includes higher level monsters we will get to see more of these issues and offer feedback accordingly. D&D Next monster design could be a great tool for the growth of organized play, which remains a valuable part of the D&D experience. Organized play creates expertise, encourages participation, serves as advertising, helps gamers get together, creates fantastic stories, helps train future Dungeon and Dragon contributors, helps fuel convention/store/home play, and has been a critical part of D&D’s history! This entry was posted on October 14, 2015 by Alphastream and tagged 3E, 4E, 5E, Conventions, Forgotten Realms, Greyhawk, Living Greyhawk, Monsters, Playtesting, RPG History.